Sorry for being MIA for the past few days. I’ve had to have my laptop battery replaced so I’ve been without my beloved computer this week. Hoping I can get you a couple reviews today of the newest Think Fast Hoodie and a Kit&Ace top I got on markdown and the Pack It Up Backpack I got for upcoming long haul travel. I’ll also have an exciting new brand review coming next week I think. "Diamond Jacquard Define Jacket, Speed Crop, Let Be Long Sleeve, Barre Star Pant, Exquisite Tank"
"High Times Pant Cosmic Dot, Let It Be LS, Bring It Om Tote"
Meh. Nothing I have to have. According the the hey lulu post the U.S. Still may not get the flurry fighter this week, lame!!!! I don't know why I bother looking at these anymore, never anything I want anymore…. Do we know if the Cashmere Bliss Pullover is coming in any more colours? Do you think US/Can will get the multi blooming pixie WUC or high times? I hope so – I am waiting for the WUC in Canada. 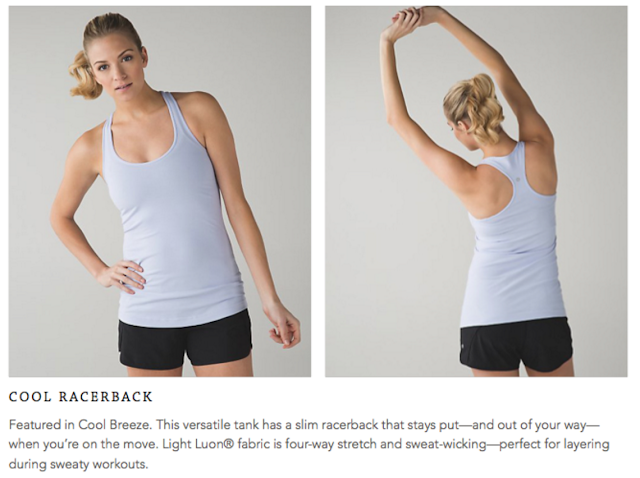 I jump on every CRB released but not sure I like this pale colour – but I think I like the peacock SS swiftly even though I have only worn my tender violet one once and still have tags on Saphire blue and dashing purple – I think because i find long sleeves hot for gym I don't think to wear them. My wallet needs a break – this week! Ordered quite a few items from last upload – yikes! And have the raspberry flurry fighter on hold at my store – I have a white one and never used it because I am afraid of getting it dirty LOL – I know I will use the raspberry one = just wish they weren't so pricey! oh good to know – I think I will pull it out to wear tomorrow when I go pick up my raspberry one LOL! IN my white down for a run jacket that I just wore today for first time – YIKES! so afraid of getting it dirty! I hear you about limiting # of tops in a particular style – I try too – most i get is 3 but I don't limit CRBs Swiftlys Speeds and of course WUC WUP and HT oh and Ebb to Street – starting to like those especially in winter! Australia got WUC and HT in blooming pixie. All 6 pairs I had a look at got assimetrical pattern placement at the back with half of the bum being white and see-through for that reason. I bought a pair and then brought it back. Nothing of interest yet again. Seems like everyone is always waiting on the same few products that never get released while tons of ugly or redundant stuff rolls out in the interim. Just bought a heathered lullaby scuba 3 in store today. It's one of the soft ones like mink berry. I love lullaby hoping for more in that color. Also bought urban warrior bag in blooming pixie since I wanted to cherry pick. Nothing here interests me thankfully. Sorry meant soft like the bark berry one from earlier in year. Unfortunately the heathered black scuba 3 is one of the stiff ones. Easy pass but a shame because I do like the color. I can't stand the stiffer scratchy fabric like the cozy cuddle up jacket, it ruins the scuba 3. Hoping they don't release a lot of colors that feel like that. Is this sale normal for Kit and Ace? Since nothing has been calling my name in Lulu-land I have gone Kit & Ace crazy lately with their recent sale. I have never tried their stuff beofre(due to price), but I just got in my two test shirts in and I am hooked. Ordering more while the price is still low. Kit & Ace will often have a few items languishing on md, but never with prices so low. Good time to stock up! All of the new stuff is coma inducing! 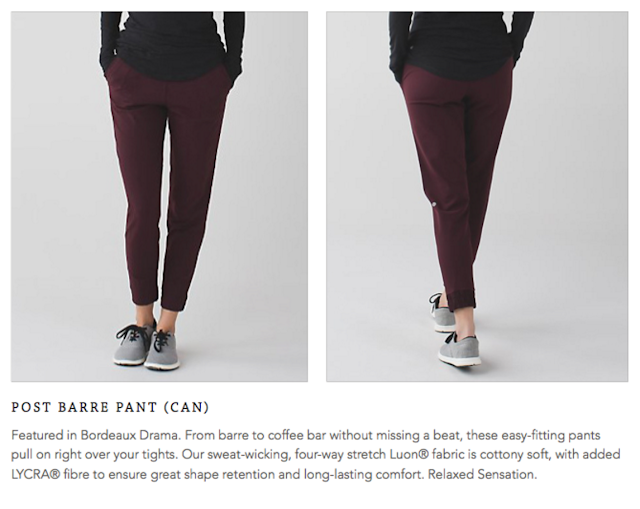 I NEVER want to see another pair of pants in Bordeaux Drama. It's so worn out, yet they have a new style in it. 🙁 No fuel green scuba in the US… I give up! It's the only thing I have wanted for the past two months. Finally Canada gets a Swiftly SS that is not a print or striped. I will for sure be buying the Heathered Peacock. I must say I was getting bored with all the heathered swiftlies but I could not bring myself to buy the striped or snake print ones. I am so loving the black heathered ones and would love to get my hands on the blue sapphire one. I tried on the Flurry Fighter and I really liked everything about it except for the slits in the band around the bottom. I am finding these days unless I love it 100% then I don't buy it but it also helped that I already have the Face the Frost 1/2 zip which I love so I said no to the Flurry Fighter. 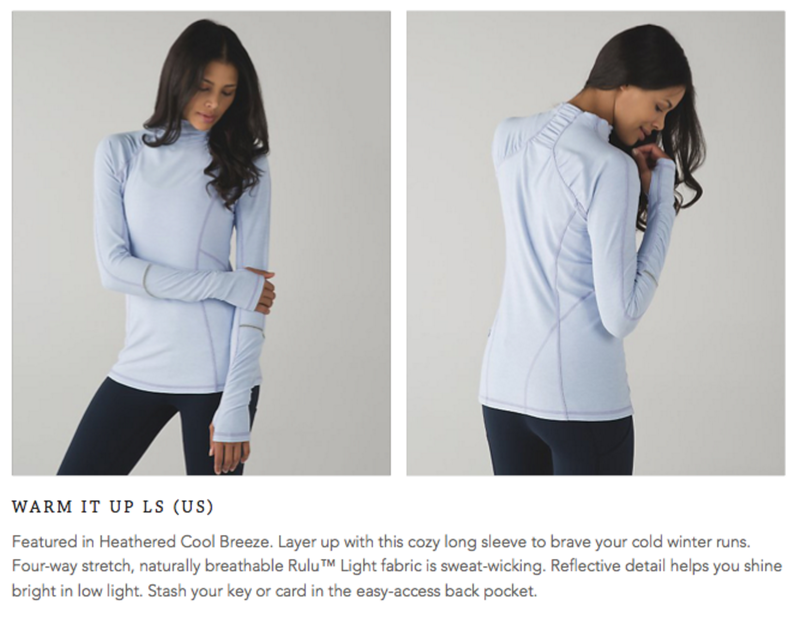 I am liking the looks of the Warm It Up LS and will be trying that one on for sure. I hope the colour choices go beyond the grey, black, spectrum but if the only other colour is cool breeze I might pass on it. Oh how I wish they would bring back nightfall, this top would look beautiful in that colour. I also want to know if more colours are coming in the Cashmere Bliss. Even though it's pricy I love it. It's so easy to throw on and comfy. It doesn't have any bells and whistles but thats why I like it. It's a classic piece that goes with everything! What color is cool breeze? It is gray, or lilac? 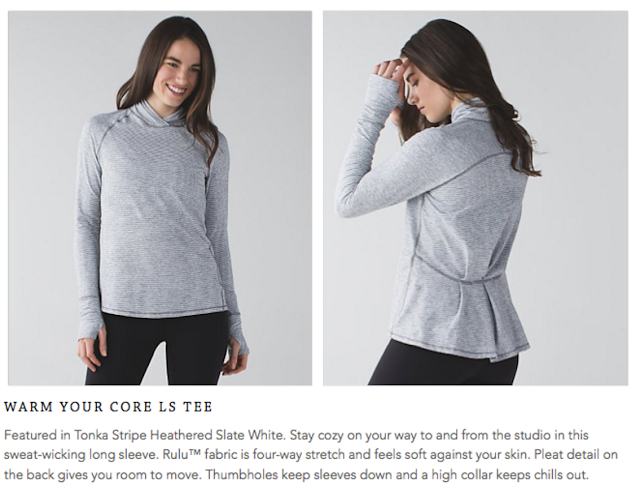 FYI – I just bought the Rest Less Pullover in Heathered Blk in a Vancouver store. The same one Agent Bobbi Morse from Agents of Shield wore that LLM referenced. The stores just restocked on the original pattern which I liked better then the one currently online in the same colour. The one I bought is the same pattern as the heathered berry rumble on the Cdn site. Cool Breeze–yawn. Have it from last time. Where is the Heathered dark green CRB for Canada? It's all I want (agreed, snooze city on the rest). Peacock swiftly ss looks nice. That's also all I am interested in. FYI – that new LS blackened swiftly in the dark berry (?correct name), is really quite maroon–thought I was going to get it but easily passed. Toronto Eaton Centre store has it. 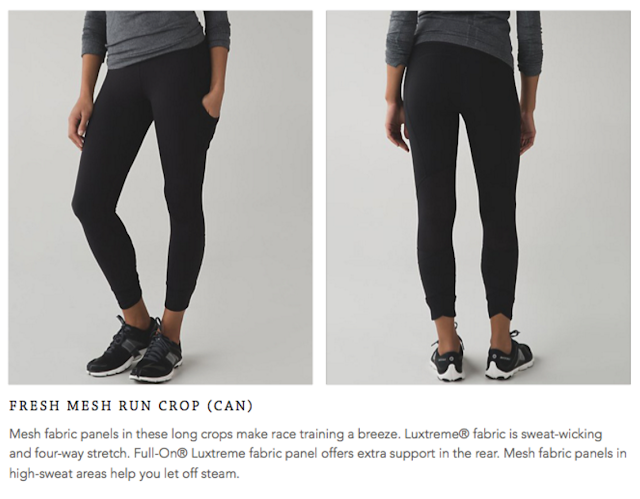 Saw some of the reflective running tights on sale too – still high and also an easy pass though I winter run and would benefit from extra reflectivity. P.S. If you are in Toronto LOLE store open in Eaton Centre – across from Gap. Good that they are there. I can never be bothered that much to go into the Yorkville one.